On Wednesday, November 22nd, Rideau Institute President and former Disarmament Ambassador Peggy Mason testified before the House of Commons Standing Committee on National Defence during its deliberations on Canada’s involvement in NATO. The entirety of her written submission can be accessed by clicking here. The most egregious assertion in the September 20th NATO statement is that the new Nuclear Ban Treaty “risks undermining the Nuclear Non-proliferation Treaty (NPT)”, which NATO correctly describes as “the heart of global non-proliferation and disarmament efforts for almost 50 years”. Precisely the opposite is true. Those states who sought to abort the nuclear ban treaty negotiation and who are now futilely trying to prevent it coming into force are of course the ones who are undermining the NPT! The second blatantly inaccurate assertion is that the nuclear ban treaty “will not engage any state actually possessing nuclear weapons”. The General Assembly vote launching the ban treaty negotiation (which was then boycotted by all NATO members except the Netherlands) was a vote of 130 in favour (including 3 brave NATO members – Albania, Estonia and Italy), 12 abstentions (including Netherlands, China, India and Pakistan) and 31 against (including Canada and the rest of NATO). In other words, the MINORITY causing the disunity and lack of consensus is accusing the overwhelming majority of being the ones at fault. Thus, the statement at the 2017 Halifax Security Forum by the Commander of the U.S. nuclear arsenal to the effect that he would never follow an order to use nuclear weapons that was illegal under international law was perhaps even more meaningful than he had intended. So where does all this leave Canada? Without such action, NATO, the most powerful conventional military alliance on earth, is on the one hand proclaiming that it needs nuclear weapons for its own security while, on the other hand, telling North Korea, as that country faces off against the United States and its allies, that it does not. Click here for the full written presentation by Rideau Institute President Peggy Mason to the House of Commons Standing Committee on National Defence. 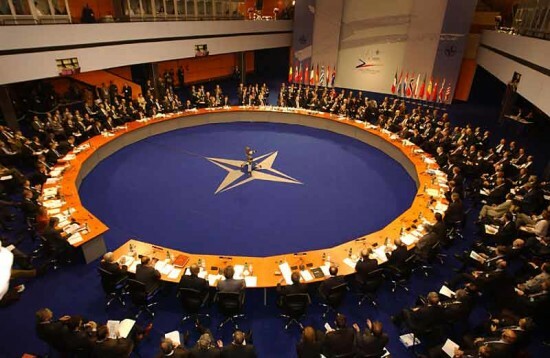 There is a long history in NATO of individual states absenting themselves from particular aspects of nuclear or other doctrine with which they disagree, and signalling their disagreement through a “footnote” in official communiqués. The most famous example is that of France absenting itself from the Nuclear Planning Group.